Gone are the days when an early date meant a candlelit dinner and a substantial bill. Today’s singles are looking for fun yet affordable food and low-pressure atmospheres that keep first-date awkwardness to a minimum. The top first-date spot in a 2018 survey of 3.5 million singles by dating app Clover? Starbucks. That shift spells big opportunity for fast-casual and quick-service brands looking to build dine-in business at a time when traffic growth remains sluggish. There were more than 125 million unmarried people age 15 and older in the U.S. last year, according to the U.S. Census Bureau. People are marrying later too, potentially lengthening the period of time the average person spends dating. The median age of first marriage in 2018 was 29.8 for men and 27.8 for women — the highest for both genders since 1890, the first year for which data is available, according to the census data. White Castle turns red when thousands of couples arrive for its popular Valentine’s Day spreads. At the same time, the rise of the online dating culture has helped drive the evolution toward more casual, low-pressure dates. In fact, Starbucks wasn’t the only major restaurant chain cited in the Clover survey. Other restaurant chains in the top 10 included Chick-fil-A, In-N-Out, Panera, Buffalo Wild Wings and The Cheesecake Factory. While the omnipresence of larger chains could be driving those brands’ appearance on the list, they’re in line with overarching trends, Bennett said. With lower price points and more casual atmosphere, those chains have “less of a barrier to entry” and they represent a smaller investment for people who are dating around. Even as they embrace more informal meetups, daters are still seeking something special. 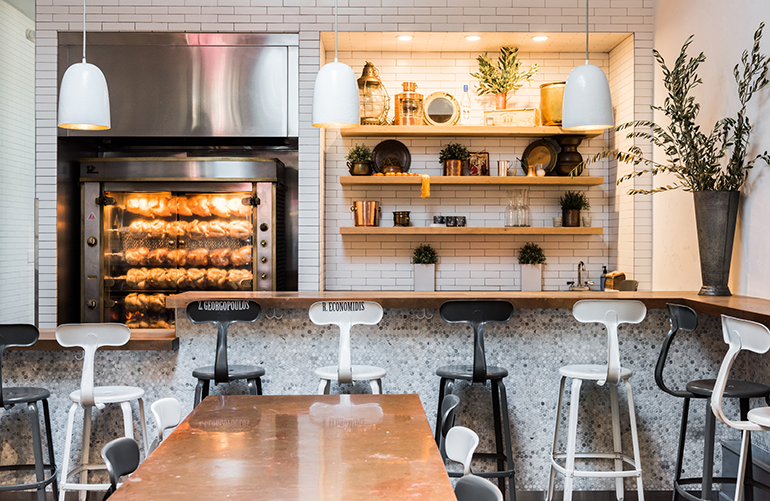 Souvla in San Francisco invites guests to linger longer in its Greek-inspired setting. Enter the fine-casual or fast-fine concept, that emerging class of brands looking to provide the ambience of a more upscale restaurant with the casual convenience of a counter-service spot, complete with silverware, beer and wine menus, and servers who bring your meals. He added that the atmosphere of the restaurants — which were designed to reflect authentic Greek homages in a two-story, open-air environment — makes people want to stay longer. It’s easier to linger at Souvla because there is no waitstaff to rush you out or people waiting for their reservation timeslot, he said. “Two people can have dinner with wine for 60 bucks, and if it doesn’t work out you can easily be on your way,” Bililies said. Occasionally some Souvla dates do work out though. The chain will be catering its first weddings this year for couples who either met at Souvla or are emotionally attached to the restaurant. Austin, Texas-based sandwich chain Schlotzsky’s has introduced a brand remodel that executives say makes it more of a date destination. Each new location will be renamed Schlotzsky’s Austin Eatery and will feature craft beer and wine menus, scratch-made, higher-end food, and a brighter, urban look. Since undergoing the transformation — which is expected to be completed by mid-2019, Schlotzsky’s has seen an uptick in dinner visits. Evening traffic has increased by 31.5 percent, and weekend traffic is up 14.5 percent in converted locations. The appeal of a more casual date experience applies to established couples as well. 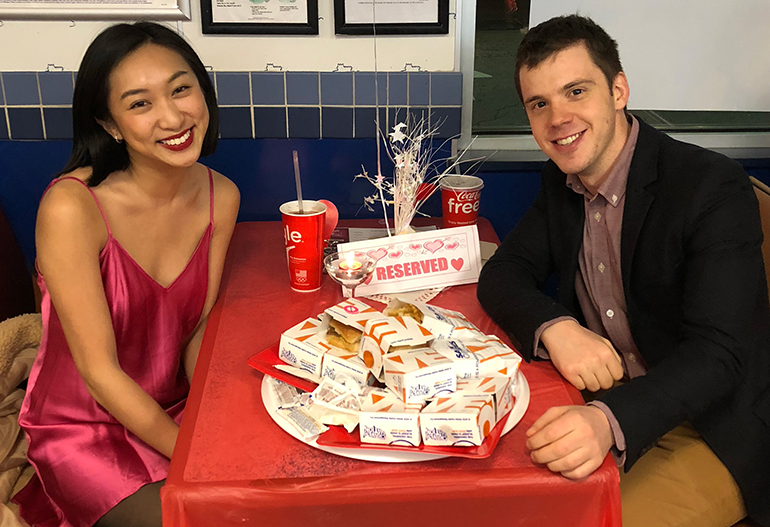 White Castle’s annual Valentine’s Day promotion, which began in 1991, now attracts at least 30,000 participants who decide to upend the traditional idea of a Valentine’s Day date and replace a pricey prix-fixe meal with a “fancy” sit-down dinner at a fast-food restaurant. Although upscale fast-casual chains may have tapped into the appeal of a more inviting atmosphere without the expense, a cheap date is not the only piece of the puzzle. Restaurants looking to win date night should look to provide an experience that facilitates conversation. He cited multi-unit restaurants like the Spanish tapas-style Norwalk, Conn.-based Barcelona restaurant with 15 locations that serves mainly shareable plates as an example of a restaurant going about this the right way. Dating expert Bennett said that traditional restaurants should go even further to break up the traditional dinner date structure with board game nights or trivia nights. Five-unit Tom’s Urban — one of a number of entertainment-driven concepts that have emerged in recent years — is primarily focused on drawing big crowds to watch major sporting and cultural events. But it still has to pass the date-worthy test, founder Tom Ryan told NRN last year. “We want to be the sports bar you can take a date to, who will be happy to go,” he said. But Gary Stibel, CEO and founder of New England Consulting, noted that restaurants should not go too far in the direction of offering entertainment because noise levels might deter people from enjoying a date night. Still, hospitality experts agree that appealing to dating singles is a smart move for restaurants. As operators think about attracting single consumers for dates, they’d be wise to appeal to them when they’re not on dates as well, experts say. The number of solo diners in the U.S. dipped by 2 percent in 2018, according to data from The NPD Group. But in previous years that number was on the rise. There are two directions restaurants can take when they want to appeal to people dining alone: Create a convivial atmosphere or allow them to eat in seclusion without feeling out of place. Seating single parties alone at tables, for instance, is one way to make solo diners feel better. But restaurants should also consider making bar areas into social gathering spots, he said.